The Best Snow Blowers For Another Snow-mageddon On The East Coast! This list is obsolete. Please go to: The Twenty Best Snow Blowers – Which Snow Blower Is Best For You? The East Coast of the United States and Canada got record snows last year and many of you struggled with snow blowers that were not up to the task. Here is a list of the highest capacity 30 inch, 26 inch and 24 inch snow blowers available. There are a few heavy-duty 27-28 inch snow blowers but there are none that are listed here. They do not have the extreme capacity of the ones on this list. Note: I have not been able to determine where the new Honda 2-stage snow blowers fit into this list. The new Honda’s do not have large engines so I have a feeling they will not make this list. I should have that information by November 1, 2015. There are two lists below. Large 30 inch snow blowers and narrower 24-26 inch. I will list them starting with the highest capacity and work down the list. 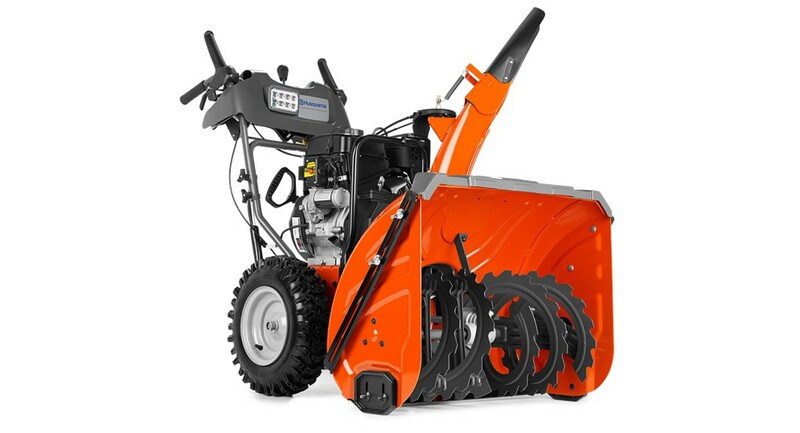 If I put the Husqvarna ST330T and Ariens Platinum 30 SHO on black top with 24 inches of newly fallen snow the Ariens will clear the area faster, but if I put them side-by-side to clear snow that has settled for a day the Husqvarna would clear it faster. Why? Traction. Because the Husqvarna has tracks it will have better traction to push through tough, hard packed snow. So if you want the biggest, baddest, highest capacity snow blower and you have smooth surfaces to clear I suggest the Ariens. If you have smooth areas, gravel, inclines or turf to clear get the Husqvarna. 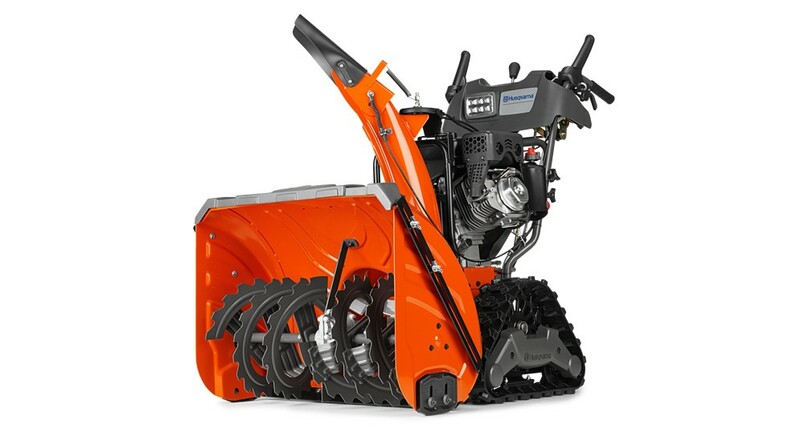 Husqvarna: ST330T – From $2499 – Engine: 414cc LCT Throws Snow 50 ft Housing: 30″w, ?” h Tires: Track”, electric start, 12″ 4 blade impeller, Hydrostatic Drive, remote chute, single hand control. Read The Review Here! Ariens Platinum 30 SHO Model 921040 – $1949/$1799 – Engine: Ariens AX 414cc (20 ft/lbs) Throws Snow 55 ft (16.76 m) Housing: 30 ”w, 21″ h Super High Output Impeller Sold exclusively through Ariens dealers. 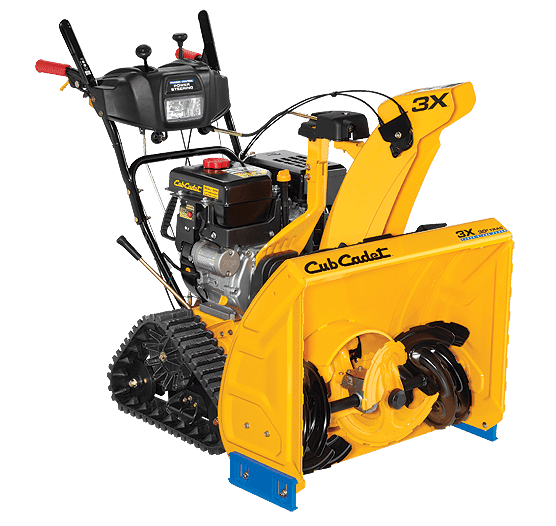 The Cub Cadet 3X™ 30 HD Trac has about the same capacity as the Ariens and Husqvarna but does not have quite as much weight to push through hard packed snow. That is why I can’t list it along with the two snow blowers above. 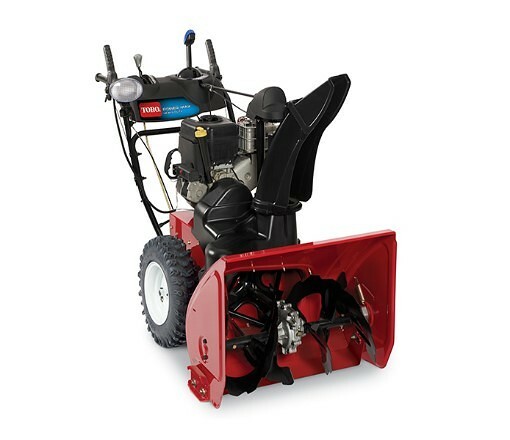 The Toro 1128 does not have as much horsepower as the 3 models listed above but because it moves snow through the unit differently it still has the high-capacity you are looking for. In addition this Toro is balanced very well-meaning all the weight is over the rear tires so it has great traction. If I put the Toro, Husqvarna, Ariens and Cub Cadet side-by-side on black top with 20 inches of fresh snow to clear the Toro would only be a few feet behind the others at the end of the run. 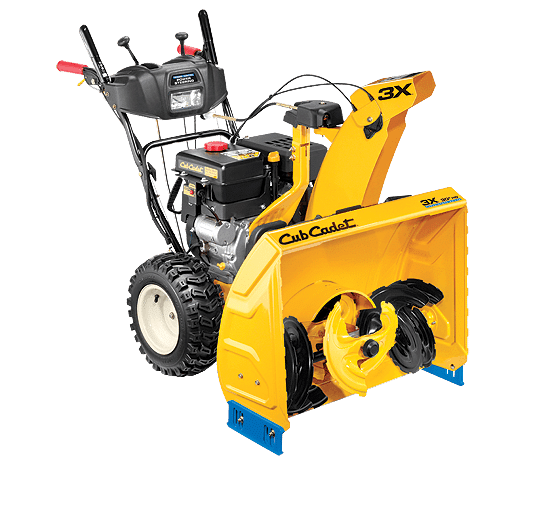 These dealer only high-capacity 3X snow blowers from Cub Cadet are different from the snow blowers available from The Home Depot. They have larger metal chutes. This gives them just a little more capacity than the versions with the black poly chutes. Husqvarna: ST330P – From $1879 – Engine: 369cc LCT Throws Snow ? ft Housing: 30″w, ?” h Tires: 15″, electric start, 12″ impeller, hydrostatic transmission, remote chute, single hand control. Read The Review Here! 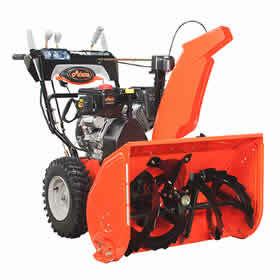 The Ariens Platinum 24 SHO is by far the highest capacity 24-26 inch snow blower on the market. Large 14 inch Super High Output impeller and a huge engine to power it. If you had snow drifts over your head last year but a smaller driveway this snow blower is definitely the best choice. Ariens Platinum 24 SHO Model 921038 – $1499 – Engine: Ariens AX 369cc Throws Snow 55 ft (16.76 m) Housing: 24 ”w, 21″ h Super High Output Impeller Sold exclusively through Ariens dealers. The Cub Cadet 3X has a little more capacity than the Craftsman Pro and Troy-Bilt Vortex because of the larger metal chute. Craftsman Pro: 88870 – $1199 – Engine: 277cc OHV Craftsman, Throws Snow ? ft (12.2 m) Housing: 24″w, 21″ h, Tires: 15″ x 5″ X-Trac, power steering, electric starter, 12″/12″/ 12″ 3 Stage System, 6 forward, 2 reverse, single hand control, Chute: 4-way joystick Read The Review Here! Last but not least. The Toro SnowMaster will only handle drifts up to 18 inches in a single pass but it has the power to cut through even the wettest, heaviest snows. If you have a small single car driveway to clear, if you live in the city and need to clean around your car and sidewalks or if you have to bring your snow blower up steps to store it this is a great choice. Great information here. I am a first time snow blower purchaser and also new to North America (4 years). I live in New Brunswick, Canada and we get hammered with snow! I have a shared driveway. My portion is approx. 55 feet by 12. If I get roped in to helping the neighbours it would be approx. 55×24. I have Toro, Ariens, Cub Cadet, Craftsmen, Husqvarna and a few other dealers within a stones throw from my house. Having a hard time deciding on a machine. I want to keep my budget around $1,200 if possible but at the same time don’t want to be underpowered and caught with my pants down in a snowstorm. When I am not around I want a machine that my wife can use too. I’m not worried about her not being able to maneuver the machine, as we are both athletic, I just want something easy to use. I had thought the Toro Powermax 826 OXE would be a good option as it is well priced in my area (Or do I just get the HD version instead?!?!). 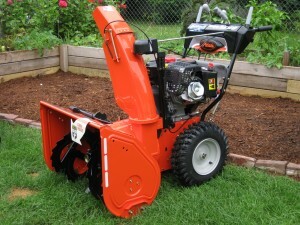 A lot of friends, family and co-workers all say Ariens but I feel like I can get the same for cheaper in other brands! Your professional insight would be highly appreciated! Hi Ben, For the size of your driveway (12/24X55) the Toro 826 OXE is a good choice but for the amount of snow you get (around 100 inches) the the Power Max HD is a better choice. They have the same engine but the HD has a larger impeller giving it higher capacity and all-around it’s a heavier duty machine. Yes, the Ariens are good machines but you can’t go wrong with a Toro either. Either the Toro Power Max or the Power Max HD will be easier for your wife to use than the Ariens Deluxe or Platinum. Paul we have 30″ Poulan that does well but our 48×48 drive needs more. We just got rid of our plow 1999 plow truck as it was breaking down with 275,000 on it. I am looking to not replace it. Going to keep the Poulan for the sidewalk and to use in tandem with a one of 45 inch options. the Craftsman Pro Series 45″and the 2X 945 SWE 45 in. 420 cc Two-Stage club cadet. 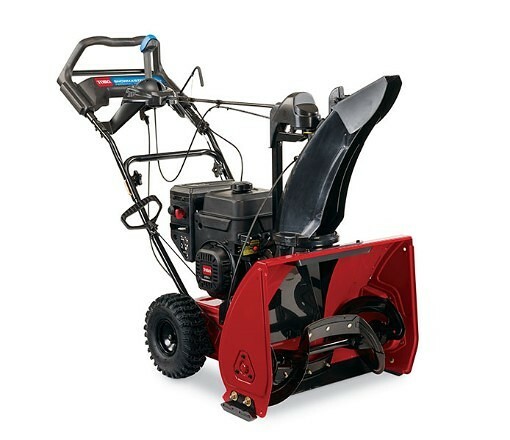 and last the Troy-Bilt Polar Blast 4510 420cc 45-in .All look about the same. All cost within a $100 and are local to me. So am I an insane to think I can replace a plow truck with this and call my brother to plow with his truck when needed? (yes I pay him) If not which one of the three? Hi mpcny, You didn’t mention where you live so I’ll have to make this a little longer than usual. Knowing where you live will give me a guess on the types and amounts of snow you get. I recommend the 45 inch snow blowers to very, very few people. 1st they only have one belt that drives the impeller/auger. So there is a huge amount of snow going through the machine even with only a few inches on the ground. Any snow over 8 inches, wet, heavy drifts, etc. can cause you to break the belt. It’s not too hard to change but most people don’t keep two or three spares. Don’t ask me why this has never been fixed….it’s been that way for years. 2nd. Even with dual wheels and over 400 lbs it really does not have good traction. Any slope, gravel area, or ice and it’s hard to turn and even hard to move forward well. By the way, there is no real difference between the three snow blowers you listed. Paint color and where you get parts are the only differences. I actually suggest the 33 inch. This snow blower does not have the problems of it’s big sister. The belt is strong enough handle even 20 inch snows through the snow blower and the single tires/weight work well. In reality you will be able to clear the lot faster and without worrying about breaking the belt. Personally I like the Craftsman the best because you can order parts for it 24/7 through searspartsdirect.com. In addition if you don’t like to work on it Sears will come right to your home for warranty and maintenance work. The price right now is also the best of the three. Oswego NY Where snow burst was coined by local forecaster Prof. Robert Sykes https://en.wikipedia.org/wiki/Snowburst We have flat parking area and 30 ” now will use in tandem. We get some wet snow but not as much as the lake effect we get 5-8 times a year we get 1-2 feet. + the once a year big one. Ave over 140 inches a year and close to 200 not uncommon. We have the option of a plow truck if needed. Hi MPCNY, You have the unique privilege of needing the biggest, baddest snow blower! I suggest using my list of the best snow blowers and pick heavy duty model. If you have any questions please comment back. “unique privilege of needing the biggest, baddest snow blower! ” Can I use that quote to my friends when I justify buying the monster? Hi MCPCNY, You sure can! Hi Paul, I am accustomed to using is a John Deere 27in TRS which still runs well but is somewhat tired (not moving snow like it used to), but has served me quite well over the years. The driveway is located in Guilford CT, is 2800 sq ft, paved and part of which is on a steep incline. I am leaning toward either the 26HD or 28HD Cub Cadet 3X snow blower. Both supposedly move 50% faster through deep snow compared to a 2 stage blower which appeals to me. Is it logical that the 28 inch with larger tires (but 12 pounds heavier) would perform better on a steep slope and move just as well as the 26 inch if I overlapped the 2 inches on each pass or should I save the difference in price and go with the lighter (but smaller wheeled) 26 inch HD model that you recommend in this article. My concern is the hill. Thanks. 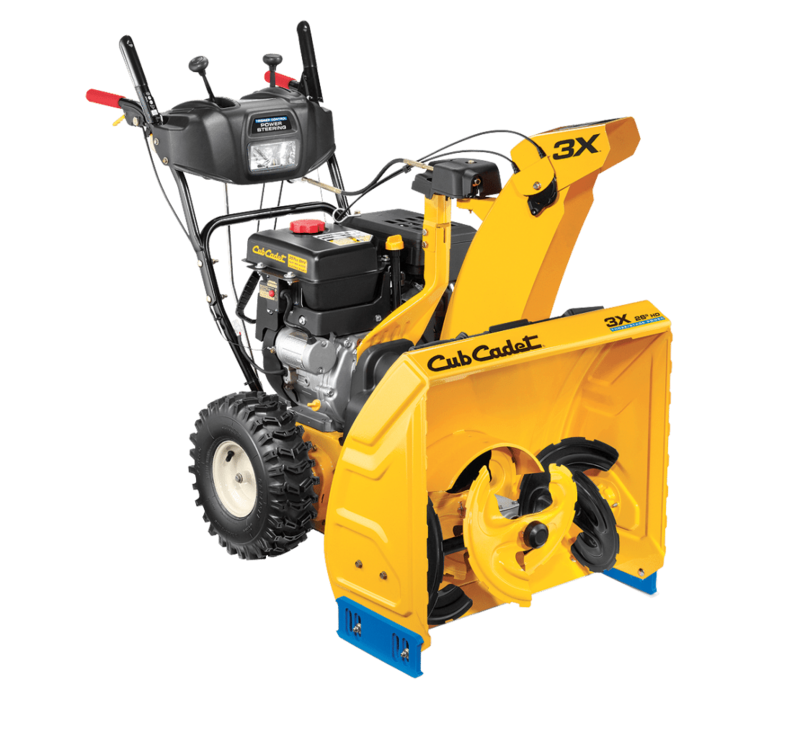 Hi Glen, Cub Cadet is the masters of marketing so just to be clear they claim it moves snow faster than Their 2-stage snow throwers – and if you pinned them down the claim would be against the residential 2-stage machines compared to the dealer only 3X HD machines. Everything else equal the 28 HD is going to give you more traction. The machine is balanced well and the taller tires will make a difference. I just realized that Craftsman also makes 3 stage snow throwers!! I read your review on the Number 2 Choice! Heavy-Duty Craftsman Pro 88874 – How does this compare to the 28 inch Cub Cadet 3X (non HD) model? Both have 357 cc engines but Cub Cadet offers a longer warranty …does that translate to a better engine? Other than that, as far as specs go, all else looks the same. Thank you for your help with this. It is greatly appreciated. Hi Glenn, The snow blowers are the same. Cub Cadet was a longer defects warranty as a selling point, not from a quality point. (If you read manufactures warranties they never cover anything that actually goes wrong with a snow blower.) The normal stuff that goes bad like starting problems, shear pins, running bricks through it, flat tires, etc are not covered by these warranties. Thanks Paul, you da man. Hi Paul, I’m looking for the least-expensive, quality snowblower I can get away with for our northern new England winters. My wife also wants to be able to use it when I travel, and she’s not the strong type. But with 3 or four 2ft snowfalls we had last winter, its gotta be sufficiently powerful. The driveway is about 150′, half of that is single car width. My wife likes the Toro SnowMaster, but I’m not sure that would cut it. @Steve, The SnowMaster is not the right choice. The practical limit for snow with it is about 14 inches. Anything deeper than that and I don’t think it will clear the snow without a lot of extra work. In my opinion buying a SnowMaster for a 150 foot driveway and New England snow is like buying a 21 inch push mower to mow 5 acres once a month. It will keep your teenager busy all summer but practically it will take forever to mow. You need a heavy-duty snow blower that is easy to use. My first choice is a 27-28 inch machine but they can be harder to use for a smaller person. So I am going to suggest a smaller, heavy duty snow blower. 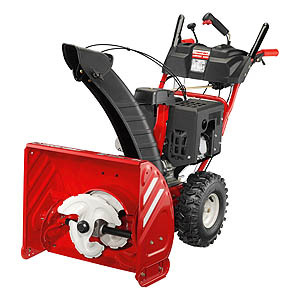 1st Choice: Craftsman Pro 24″ 277cc Three Stage Snowthrower w/ Power Steering . 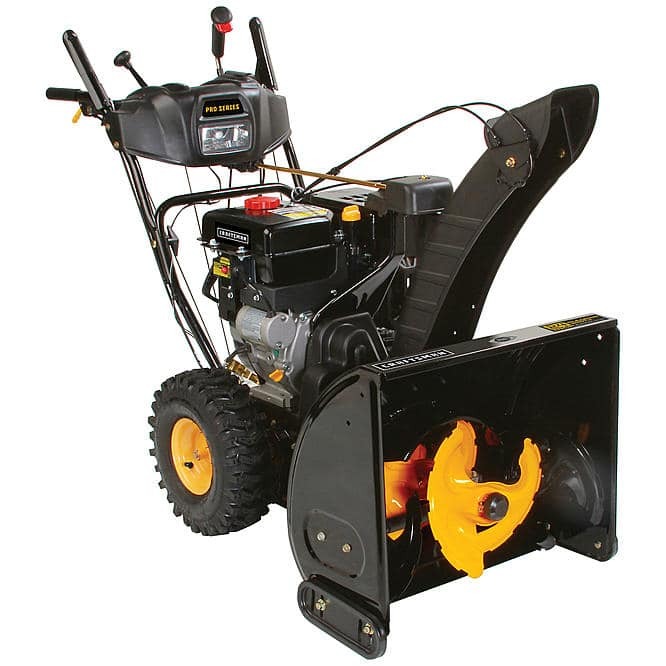 This snow blower is easy to use because of the power steering and joystick chute control. It will easily handle the 20-24 inch snow and blow them out of the way. The handles are at the right height for people less than 6 feet. Best of all if your wife has any problems with it all she has to do is call Sears Repair Services and they come right to your home to work on it. 3rd Choice: HUSQVARNA ST324P 24In 2-Stage . The other two snowblowers are made by MTD. If you would rather buy from someone else the Husqvarna is also an easy-to-use snow blower. It has the capacity to clear your deep snow. Repairs are done by your local Husqvarna Dealer. I don’t suggest the Ariens Deluxe 24 because the handles are too high for smaller people. I’m not going to suggest the Toro PowerMax HD because of the price. Yes, there are cheaper snow blowers but all of them don’t have the capacity you need or the ease of use your wife requires. Looking to buy a used Craftsman snow blower attachment. Will the attachment from mower model #917276601 work on model #917271051? Hi Bill, Both of the tractors are 4-link decks so that part says the snow blower should match up. But the 276601 is pretty old. I’m not sure it has the right holes to mount a 486 series snow blower. You can get the assembly manual for the snowblower itself by going to searspartsdirect.com and put in the model number of the snow blower. It’s a tag somewhere on the blower housing and it will start with 486. Read the instructions to make sure you get all the parts. Be sure you get the parts off of the frame of the tractor. LOL. It did not have triggers….it’s not a hydro. I did not even looked at it. I just glanced at the control panel and saw a standard disc based control.. Interesting read on Husky make Husky. Any thoughts/feedback on why the front bezel, handlebars, drift cutters, etc looked so similar to the Husky. Good info re: steel thickness. Was at Costco doing weekend food shopping, and noticed they had Cub Cadet. Similar bezels, drift cutter, etc as the majority of the AYP lineup, etc. Engine, transmission aside — everything else seems to be a dead ringer. The metal on the CC was not as thick as my former HS928. Anyone know who makes Huskys and is the thickness of the metal used on the 300 series on par with like competitors like Ariens or Honda ? Hi al, AYP does not make Cub Cadet. Those are made by MTD. MTD also makes Craftsman, Troy-Bilt and Columbia. Did the Costco have triggers under the handles? Metal thickness has no real bearing on the quality of the machine. Some, like Ariens use mild steel so it is thicker. Other manufacturers, like Toro use a high tensile steel so even though it is thinner – it’s just as tough. I assume you are asking who makes the Husqvarna snow blowers – not the Huskee sold at Tractor Supply. Husqvarna is made by Husqvarna. Your Honda is now the HSS928ATD. It sells for $2909. I would hope it is better than the $800 Cub Cadet at Costco. Hi al, The old Crown series had it’s issues and Husqvarna spent 3 years re-engineering every component. A lot of the new 300 series is the same but all of the problem areas were fixed. For, example the steering on the 30 inch units was changed and it now doesn’t stick. Slipping belts have been fixed and the new LCT engines have cured starting issues they old Husqvarna’s had. I like the 300 series a lot. I have a ST327P here to use this year and comparing it to the old 1830 I have there are many nice changes. Thx. I was looking at the 327 myself. How doe you move the unit when the engine is off . Their online Manual is very sparse. Hi al, Just pull both power steering triggers. (the levers under the handles) It will then freewheel.